This weekend Mark and I went to OKC to start some Christmas shopping, check out the baby section at Target, and see a movie. (We saw Eagle Eye, with Shia Lebeouf and it was pretty good.) We had some time in between shopping and the movie so we decided to drive around thru some of the rich neighborhoods in the city. Thank God Mark likes to do that too - we have a good time driving around and looking at all the nice houses and dreaming about our future. We were cracking up at how most of the huge, expensive houses had the McCain/Palin signs in their yards, and when you'd get into the "normal" neighborhoods, there would be Obama/Biden signs galore. It was funny how there was a definite shift in political parties depending on the "class" of neighborhood we were in. But anyway, we got some of our shopping done, and looking at the baby stuff made us really excited about this blueberry. Late Saturday morning I got a headache - migraine actually. I tried taking tylenol for it, but tylenol does absolutely nothing for my migraines. I have prescribed extra strength Ibuprofen for migraines, but you're not supposed to take Ibuprofen when you're pregnant. So I took like 14 tylenol over a 48 hour time frame and I still pretty much had my migraine. This morning on my way to work I had a flat tire, so while I was waiting for Mark to come help me (he takes very good care of me), I called my doctor to see if I could take anything else besides tylenol since I was getting sick of having a headache. They surprisingly asked me to come in for an appt at 1:30 today. It kind of scared me a little because I wasn't expecting them to ask me to come in at all, and I thought maybe they thought something was wrong. I was already a "little" worried because my mom said that she didn't have any headaches at all the whole time she was pregnant and I have it in my mind that my pregnancy is going to be exactly like hers, even though that's obviously not the case. But I thought that because I was having a headache, that maybe that meant something was wrong with the blueberry. So I went to my appt by myself since Mark was flying. My blood pressure was 128/87 - it's high every time I go to the dr. He prescribed me some meds I can take for my migraines (hopefully I won't have to use them much) and then asked if I'd like another ultrasound. Of course I did!! 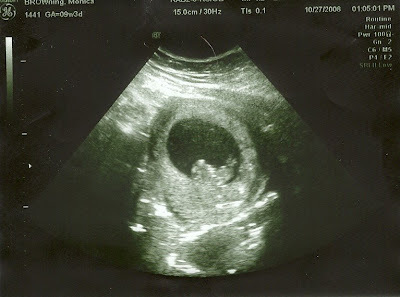 So I got my second ultrasound and it was amazing. I'm pretty bummed that Mark wasn't able to see it, because it was so neat to see. Last time the blueberry was just a little ball. And this time you could see it's head and arms and legs and it was moving all over the place!! It's about 3 cm long and the heart rate was 167 bpm (last time it was 148). I just can't believe how much the little thing has grown in the past 3 weeks. And it was SOO neat to see it moving it's little arms and legs. It's hard to believe that thing is inside me and moving that much and I don't even feel it. I think I could be starting to show a little bit. I had to do the rubberband trick with my pants today for the first time and tight waists on pants are bugging me some. Here's the most recent picture of our blueberry. The head is on the left side and it's little legs are on the right side. And the little white dot that looks like it's on it's belly is it's arm. It was waving it all over the place! On a different note, my mom told me today my parents are coming to visit us for Thanksgiving and I'm SOO excited! It'll be our first Thanksgiving with family since Mark and I have been together (3 years). In the previous years we've just Thanksgiving by ourselves or with friends, which was fun, but I always associate Thanksgiving with spending time with family, so I'm really excited my parents are coming to see us. Congratulations on the news of your little one! We are so excited and happy for you! It is great to catch up and see what is going with you through your blog. This is my first thanksgiving with some of my family coming to visit me too. I am excited as well. I am sorry to hear about the headache. I was worried I would get sinus headaches while pregnant because for me they can be extremely bad and nothing semes to help. Luckily I did not but I did catch a few colds and was miserable.